OXFORD, Miss. – A crew of University of Mississippi students spent their time Monday (Jan. 21) improving the lives of citizens in a neighboring town on Martin Luther King Jr. Day. M Partner, a community partnership program that helps match university capabilities with the goals and needs of local communities, took a group of 50 UM students and members of the North Mississippi VISTA Project to New Albany for a day of service. Following opening remarks and receiving instructions at the Union County Heritage Museum, the group dispersed to its three project sites. 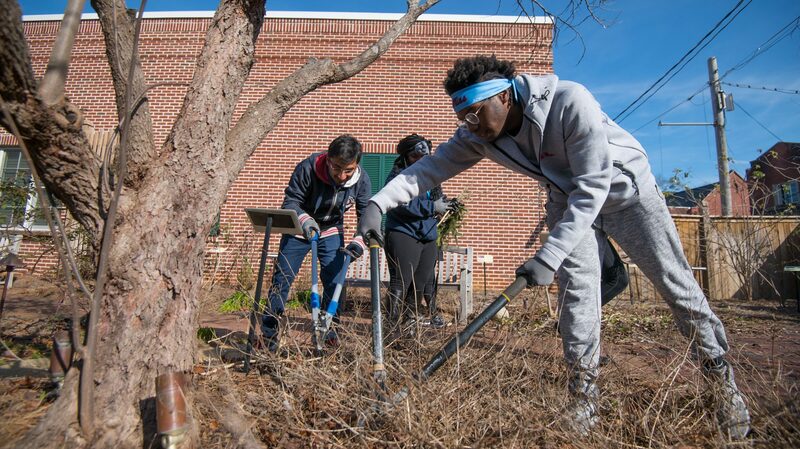 Sites included the museum, where they mulched, and the adjoining Faulkner Garden, where they prepped the gardens for spring; the community center, where they performed maintenance tasks inside and out; and the Park Along the River, where they did general cleanup around the playground. “The MLK Day of Service in New Albany was an opportunity to strengthen partnerships and build upon the inaugural M Partner Community Day of Service that took place last October,” said Laura Martin, M Partner director and associate director of the McLean Institute for Public Service and Community Engagement. Since announcing New Albany as one of the M Partner pilot communities last March, the McLean Institute has built many partnerships in the city, including VISTA summer associates at the New Albany and Union County school districts. VISTA members also serve year-round at the Heritage Museum, Minority PUL Alliance and Tallahatchie Arts Council. The students found being able to serve a privilege and a pleasure. 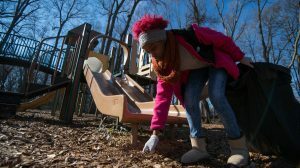 Becky Rinehart, an AmeriCorp VISTA member at the museum, said she was “quite excited” that volunteers cleaned up around the playground at the Park Along the River. The presence and participation of Ole Miss students and VISTA volunteers was much welcomed and appreciated, said Billye Jean Stroud, director of community development for the New Albany Main Street Association. “Anytime a community can partner with young people by using their skill sets for the betterment of that community, it is a win-win for both groups,” Stroud said. “The city stays beautiful and the students learn what it means to serve and to give back.